It was a great day, and we are so lucky to have friends and family willing to be a part of this. We started pretty early , but let me show you what the foundation looks like. These are pressure treated posts set about 2.5 feet deep on a 3"x10"x18" board to spread the weight. (Did you know wood needs water and air to rot? Since the wood here is buried snugly, air will not access it.) Damon helped me start digging and setting these, and I've finished them over the past few weeks. 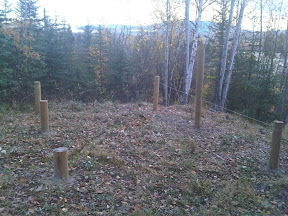 We cut the posts level (with a line level, chainsaw and grinder) and set our first row in place so we could square it. You see my uncle David eyeing something. The front porch is cantilevered, but that will be more obvious later. 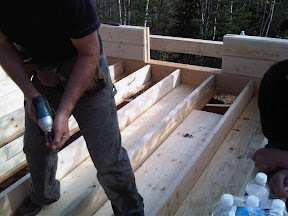 While some of us leveled and squared, others unloaded the truck and started cutting floor joists. 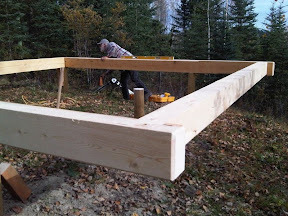 The floor joists were hung on metal hangers, and we screwed 1"x4" to their lower sides - the lip being a support for inlaid plywood. This was easier than trying to attach full plywood sheets from underneath. The crawlspace has as little as 10 inches of clearance in one corner. 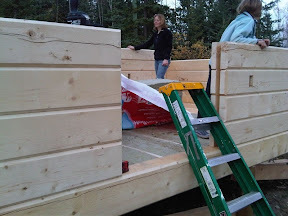 Before installing the fiberglass and vapor barrier, we tuck-taped all the seams. 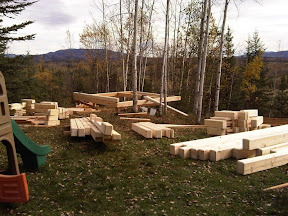 We finished with the floor (3/4 inch tongue-and-groove plywood) laid but not yet fastened, and about 6 rows of logs up. It looked like it might rain, so before going in and having Joanne's most excellent turkey, we covered it all with a tarp. Tim, Bobbi, Matt, Damon, and Uncle David deserve a huge amounts of thanks for helping today, and some of them are coming back tomorrow.